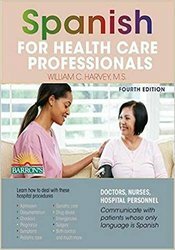 This book is designed to help doctors, nurses, and medical assistants communicate in Spanish with Latino patients and their families who have little or no command of English. Fully updated text includes the addition of vocabulary for informing families about patients’ medical care or death; instructing patients on how to navigate online forms; a sample disclosure and consent form in both Spanish and English; and a new section on working with medical interpreters. Every Spanish word in the book is followed by its phonetic pronunciation. The book also provides easy-to-follow tips on understanding colloquial spoken Spanish. Author William Harvey concentrates on words and phrases likely to be used in a medical setting. True-to-life dialogues dramatize situations pertaining to pregnancy, broken bones, pediatric care, heart and lung diseases, pharmacy prescriptions, and much more. Mr. Harvey is a nationally-recognized teacher, author, and motivational speaker, often considered by experts to be one of the best language and diversity instructors in America today. He is founder and president of Language Services Institute, a successful on-site language school which currently has some of the most comprehensive training programs in Southern California. As a 30-year veteran of teaching Spanish, English, and Cultural Awareness, Bill has received national media attention from CNN, Spanish News Network, Time Magazine, The New York Times, and The Los Angeles Times . Mr. Harvey holds a Bachelor of Arts degree in Spanish and a Master of Science in Bilingual Education, and has received numerous awards for his work in public education. He is author of several books, including Spanish for Gringos, Inglés para Latinos, Spanish for Health Care Professionals, Household Spanish, and Spanish for Law Enforcement Personnel. William C. Harvey currently resides in Orange County, California, with his best friend and wife, Cecilia Carro-Harvey, and their roommate, Canela, one of the few golden retrievers who can understand at least two languages. Your satisfaction is our goal and our guarantee. Concerns should be addressed to PESI Inc., PO Box 1000, Eau Claire, WI 54702-1000 or call 1-800-844-8260. We would be happy to accommodate your ADA needs; please call our Customer Service Department for more information at 1-800-844-8260.